Carolyn Massier's second-graders work together on a mathematics lesson. Great educators, like Rock Cut Elementary teacher and 2014 Golden Apple recipient Carolyn Massier ’05, understand the incredibly powerful impact educators have in the lives of the children they teach. “Miss Massier,” as the students in her second grade classroom call her, is the kind of teacher former students return to their old elementary school to see. Former students, like the sixth-grader who nominated her for this prestigious award, may not remember what she said or did, but they certainly remember how successful she made they feel. Massier, who earned a bachelor’s of science in elementary education from Illinois State, has taught second grade in Harlem School District #122 for nine years. She later went on to earn a graduate degree and an endorsement in English as a Second Language (ESL). Carolyn Massier received the 2014 Golden Apple Foundation award. “The best thing about Miss Massier is she gets our brain full of stuff,” said second grade student Allie. Her classmate, Darryl, echoed the sentiment by saying his favorite thing about their teacher was that “she lets us have time to do our work.” Other descriptors the students used to talk about their teacher were fun, nice, and helpful. Members of the Golden Apple Foundation surprised Massier with a visit to her classroom to present her with the award. Two months later, she attended the formal banquet with her family, colleagues, and school board members. Massier received a cash award, a stipend for professional development, a scholarship for continuing education, a new laptop, and resources to enhance her classroom. Illinois State interviewed the alumna at her school in Loves Park about the teacher preparation she received at the University, and how it set the stage for her successful career in education. 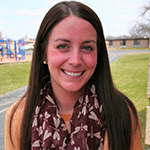 Why did you choose Illinois State to earn your bachelor’s degree and teaching license in elementary education? I chose ISU because I knew that it had a great reputation for being a school for students who wanted to become teachers. Plus, my sister (Laura Massier ’02) went to ISU and had a great experience. Massier’s second-graders are instructed on a mathematics lesson. How has your Illinois State education added value to your career? My coursework at Illinois State has given me a lot of knowledge and tools necessary for being an excellent teacher and leader. People also know and respect ISU as a great teaching school. How have the changing demographics of Northern Illinois impacted the need for more diverse instructional practices and continuing education? I’m seeing all different types of students from all different types of backgrounds. I recognize that students learn in their own unique way. This is part of the reason I have furthered my education, but doing so was also largely influenced by my love of learning. My philosophy is that all students can learn, and I do my best to come up with the strategies and tools to make this happen. Who mentored or encouraged you while you were a student at Illinois State? There were two individuals who were extremely influential while I was a student at ISU and a student teacher at Ralston Elementary School (an elementary school in Harlem District #122). My cooperating teacher, Andrea Carter, and my student teaching supervisor, Connie Tucker, encouraged me and helped me to build my confidence. I’m still using strategies and ideas in my classroom that I received from my cooperating teacher almost 10 years ago. I had an amazing student teaching experience and feel so fortunate because of it. If you could pass along something you learned at Illinois State to a new or future teacher, what would that be? I would say that building relationships with professors and fellow students is a key element to success. Teachers do best when they work as a team and accept ideas and knowledge from others. Also, have fun and love what you do! Your students will pick up on your attitude first and what you’re teaching them second, so make your attitude a good one!